Located about 3.5 miles north of the bridge, sandwiched between Captain Morgan’s Resort & Casino to the south and Coco Beach to the north, is Essene Way. A large property right on the beach that has been closed for quite a while, I took a walk around this place yesterday and found it very very intriguing.It has a wedding chapel, biblical references, angel and eagle statuary, large empty pools, a huge cement whale, a crumbling dock, a cracked basketball court and overgrown trees and bushes. There appear to be quite a few people living on the property. What was this place? When was it built? What was it used for? Why was it listed in this probably 15 year old article in Belize First as one of the 10 best hotels on Ambergris Caye? (How times have changed! Belize Yacht Club? Coconuts?) I certainly didn’t answer all of my questions…but here is what my internet research yielded me. Take this all with a grain of salt…some was cobbled together from the various forum discussions. Open as early as the 80s, this property was called The Belizean Hotel. The luxury hotel was built and run by a French family, the Pierres, (possibly the heirs to the company that produces Perrier water) but sold when a family member passed (or it went bust…there are a few accounts). Apparently they were well known for lavish parties and entertaining. According to Belizefirst.com, the facility was then purchased in 1993, was renovated for $7 million USD and then opened in 1997 by developer, biblical scholar and food supplement entrepreneur Tom Ciola (owner of “Hot Stuff” supplements) to offer free vacations to terminally ill adults. Mr. Ciola entered into a $2 million USD contract with an American company for complete solar energy. There was also a reverse osmosis water treatment system in place. When the resort opened, Ciola stated that they didn’t have enough funds yet to make the property 100% humanitarian but that was the end goal. (Rates at the time were quoted as $125 USD a night). Now that sends me off on a tangent. Tom Ciola, author of books like “Steroids Kill!” and “Moses Wasn’t Fat” a biblical approach to health and fitness, was involved in athletics and the natural health movement since the 1960s. Apparently God singled out 7 foods as important: wheat, barley, vines, fig trees, pomengranates, olive oil and honey. (Those who are eat gluten free beware this biblical wrath). 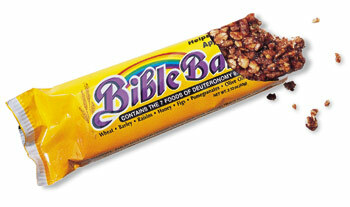 He created a nutrional granola bar called “The Bible Bar”. When the bar became a hit at Christian stores, he expanded his line, according to Motherjones.com, to include Bible Granola, The Seeds of Samson (a seed and nut bar) and Back to the Garden, a bible based meal replacer. You can’t make this stuff up. This book and the bar seemed to cause some controversy at the time (as well as some people poking fun)… there are short articles in CNN.com, the New York Times and NPR about it. You can see Captain Morgan’s behind the buildings. Essene Way and all of Ambergris Caye was hit hard by Hurricane Keith during the first few days of October, 2000. All 1200 solar panels were lost at the resort. Paul Ciola, the owner’s son, operated a pizza restaurant and delivery service on the property before the hurricane. A few years later, he returned and opened another pizza joint in town. It was called Pauly’s Pizza. (There is a full article on the operation in this 2005 San Pedro Sun. I like Pauly’s money back guarantee on pizza. Pedro’s take note). Caliente, a very popular Mexican food place, also used to have an outpost as “Caliente North” at Essene Way. It appears that Reverends Tom and Paul Ciola are currently performing wedding ceremonies in Orlando. See: Vows Are Forever for pictures of them and more information. Here is the closed wedding chapel at Essene Way. It has quite a stained glass window behind that overgrown tree. According to some travel sites, Essene Way was operating as a resort as late as 2005…or maybe it was called Eden Villas at that point. I’m guessing another owner? One contributor to a site indicates that perhaps Las Terrazas resort or maybe even Captain Morgan’s purchased the area some time ago, own it now and have yet to develop it. I find all of this fascinating…almost too interesting to be true. And the actual property just as interesting. Anyone who has been here longer than me (6 years now), probably knows lots about this mystery development. Any and all information or speculation on this property would be appreciated. Now I’m hooked. This actually explains a lot! We rode our bikes through the abandoned resort many times in February and were just scratching our heads wondering ‘what the heck’! And no one we asked seemed to know anything. The gaudy lions and columns seemed so out of place! The columns! I know…crazy. And cool. I didn’t want to leave! There is an American hermit I met up there that lives among the ruins that, I understand, is the former leader of a sect of Chinese Fransiscan Monks called the “Essenes” that were in the process of starting up a monastery on the property when the hurricane struck. The Essenes practice christainity, kung fu and meditation through exercise. The hermit is all that remains of this sect in Belize. I know the Ciola family- I have for over 20 years. They are some of the nicest people you could ever meet. I don’t want to seem rude or anything, but your article makes them seem very mysterious. They were/are not as mysterious as you think. They were just like anyone else, trying to make some money at a really great and beautiful resort. I know Paul and his wife Beth. Beth has been my best friend for almost 30 years. I just want to say that the Ciola’s were very very good to everyone on that island. The locals respected and loved them. They are not ‘creepy’ people, which is the way that I kind of took your article. What place doesn’t look mysterious after it has been abandoned for years? The Ciola’s had their family living there on this beautiful island and are proud that they lived in such an awesome place. They are just entrepreneurs. Ya know? I hate to debunk the mystery of them leaving, but the hurricane pretty much was a deal breaker. My best friend and her children almost died in that storm. Beautiful? Yes it was in its day- mysterious? Not so much. is not used for anything but storage now. For some reason I was thinking about this place. We found it in 2012 when staying at Captain Morgan’s Resort. It felt very strange then and does so now looking at these photos. We met a guy who lives in a house on the property and he took us on a fishing trip. When we returned after a lovely day on the water and up at the tip of the Caye, we were accused of losing a flipper and had to pay $100. It was bizarre and an expensive exercise. Does anyone know if it is still in the same condition now? We were just there last week (April 4-11 2019) and it is still in the same condition. We were fascinated by it so I decided to do some research and found this article. The real story is SO CRAZY. The property is for sale…though I haven’t seen how much it is listed for…and I imagine at some point a huge resort will be there. But until then…I love this crazy fantasy bizarro spot.